TODAY could be Britain’s hottest June day for 40 years. Highs of 34C (93F) are forecast in west London on today, which would make it the hottest June day since the 35.6C (96F) recorded in Southampton on June 28 1976. If the mercury surpasses the 31.7C (89F) recorded at Camden Square, north London, in 1936, it will be the hottest summer solstice on record. 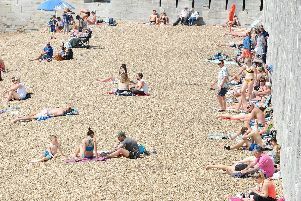 Temperatures in the Portsmouth area are expected to reach 25C. It would also make it the fifth consecutive day that temperatures have topped 30C (86F) in the UK, the Met Office said. The last time the country saw a similar run of hot June weather was more than 20 years ago, from June 26 to June 30 1995. It was on June 30 of that year that the highest temperature since 1976, 33.8C (92.8F) in Worcester, was recorded. While the mercury is set to edge higher than that, it is unlikely to beat the 1970’s scorcher, the hottest June day since records began. A level three amber warning, one behind a national emergency, has been in place regarding England’s sweltering temperatures. A yellow weather warning for heavy rain spanning from 3am on Wednesday until 6am on Thursday has also been issued for south-west Scotland, England and Wales. Bouts of rain, heavy and thundery at times, are expected to move in from the west to initially affect parts of northern England, with potentially 20mm or 30mm of rain falling in one or two hours. More extensive thunderstorms may then spread South over a larger part of England and Wales from late Wednesday afternoon into the night, leading to torrential downpours, frequent lightning and a chance of hail. Some houses, businesses and transport routes may be affected by localised flooding, while power supplies in some areas could be temporarily disrupted due to a combination of heavy rain and frequent lightning strikes. While much of England is covered by the warning, the Met Office said it was likely that many parts would see dry and sunny weather through much of the daytime on Wednesday. Monday saw the UK’s hottest day of the year, with 32.5C (91F) recorded at Hampton Water Works in Greater London. Many places across the South saw the mercury hitting at least 30C (88.5F) on Tuesday, with highs of 31.4C (88.5F), recorded at both Heathrow Airport and Wisley, Surrey, at around 3pm. In Guildford, Surrey Police said spilt oil had melted into a tarmac road due to the scorching conditions. A teenage boy drowned in a reservoir at Greenbooth Reservoir, a moorland beauty spot outside Rochdale, Greater Manchester, after reportedly getting into difficulties while swimming in the hot weather. A woman in her 80s also died after being pulled from the sea at East Wittering beach in West Sussex on Monday afternoon, Sussex Police said. At Royal Ascot in Berkshire race organisers said they were considering relaxing the strict dress code for the first time. Music fans arriving at Glastonbury festival on Wednesday will face a sweaty walk to pitch their tents with highs of 30C (86F) expected. The NHS has urged the elderly, children and those with medical conditions to keep cool and hydrated during the heatwave. Those at risk are warned to keep in the shade during the hottest part of the day between 11am and 3pm. Police and Fire services have also been tweeting advice on how to enjoy the sun safely, as Brits get out the barbecue and swim outdoors to cool off.